The sound of the marching of jack-booted troopers permeates Cabaret Noir, Bremner Duthie’s oddly gripping tribute to French and German cabaret during the Nazi years of the late 1930s. You can’t always hear the ominous sounds of boots outside the door. But, as Duthie sings his songs, you know that they’re there. 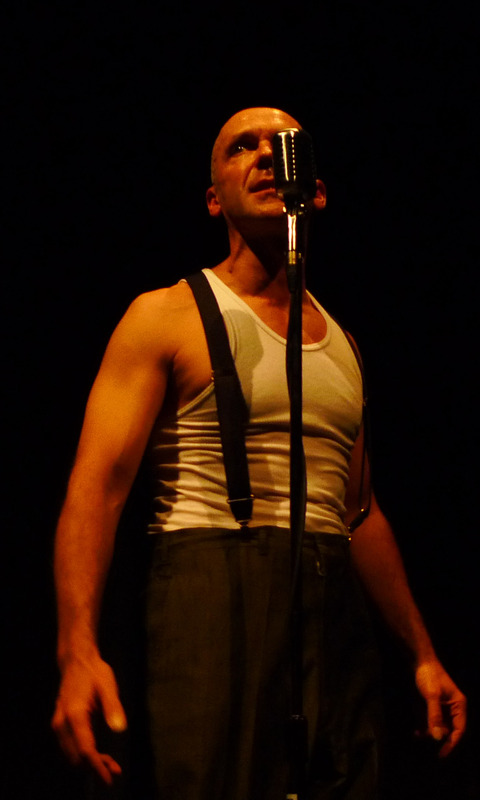 Duthie, a Canadian-American who grew up shuttling between North America and Scotland, did a German-flavored Kurt Weill cabaret show at the Fringe in 2008, and he knows his stuff. Even though all the songs that he performs this time around aren’t from the era (Stephen Sondheim’s pastiche song “I Never Do Anything Twice” turns up), the war-ravaged feeling in Cabaret Noir is authentic. And Duthie himself, with his shaved head, haunted face and gorgeously delicate baritone, is utterly arresting as the vanquished impresario of a ruined cabaret, haltingly gathering his paltry things together before he tries to escape into the dark. Too bad, then, that his writing doesn’t rival his voice: Cabaret Noir feels underwritten, and it’s stronger on atmosphere than it is on explanation. A show like this doesn’t need a plot, but it does need some forward movement. Duthie’s singing is magical, but his show needs a shape to contain that magic. Otherwise, like the impresario itself, it just drifts into the night. Saturday May 21, 7:25 p.m.
Sunday May 22, 8:55 p.m.
Tuesday May 24, 10:30 p.m.
Friday May 27, 10:10 p.m.
Saturday May 28, 8:30 p.m.